As you can see ....the trade was totally AWESOME!!!!! Thank you Ladies for trading with me. If you want to trade again be sure to tell me. 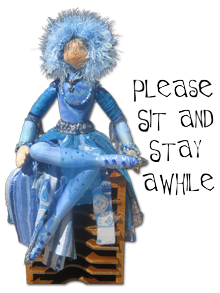 And if you have not traded with us before...please let me know..we would love to have you join us. As a reminder if the names are highlighted they have a blog...so be sure to check out their wonderful blogs. The next trade theme is Monochromatic...which means..all the same color. Fabric, thread, and embellishments all the same color family. They are due October 15th. It was just a quiet day.... not expecting to find much of anything. Just decided to hit a few of my favorite stores. Well, I came home a very happy camper...here are my treasures for the day!! 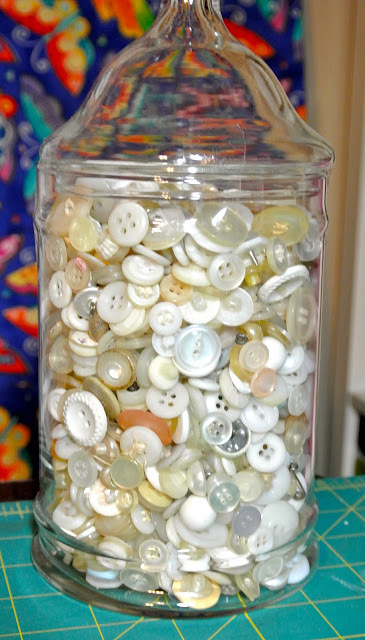 I found this wonderful jar of yummy buttons!! I also found these hankies!! ....happy, happy dance!! I am doing a lot of art journaling lately too!! I really like making my own journals. So, I have been on the hunt to find very unique and cool vintage books. So, I can turn them into journals!! I love this book the cover is very embossed and detailed!! Yummy!!! .....more dancing!!! 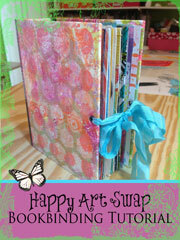 ....and the wonderful yummy pages will be reused into the art journal and other mixed media art. Happy dance again!! Then the final treasure I found....a new baby!!! I collect these little sewing machines. I buy them when ever I see them!! Which is not very often. ..and it is in my favorite color too!! Happy dance... happy dance...happy dance!!!! Wosh...I am tired!! Why am I so tired?? Oh, yeah!! I have been dancing all day!!! :O) Believe it on not..I found all these treasures in one day!! A very GOOD day...if you ask me!! Here's to every one having such a treasure filled day!! Wonderful Friends and their Gifts!! I have been extremely blessed with all my blog land friends!! I have met the most wonderful artsy people!!! I have gotten several gifts in the mail of late..and I wanted to share and say thank you!! First up is the Lovely Marilou from Lulus Lovlies. When she sent me her quilties there was and extra surprise present...WASHI tape!!!! I LOVE washi tape. Marilou reads my blog so she was well aware of my passion for tapes. THANK YOU...MamaLou!!! You are a sweety!! 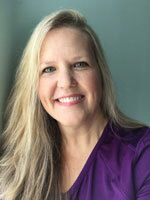 Judy has a great blog that you should check out at Judy's Fabrications!!! !....I have been following her for some time now. And have always loved her little dolls. So, when I opened her package and found this little beauty waiting for me.... I think I actually squealed!!! :O) She is beautiful Judy...thank you!! Then I entered a free give-a-way and won!!!! 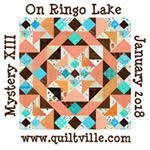 Roc has a cool art journal blog called What's Up Roc. I won this really cute stamp from her. She has designed her own set of very cool stamps. Thank you Roc!!! Well, That is my show and tell for the day!!! Thanks so much for all the comments every one leaves me! It means so very much!!! 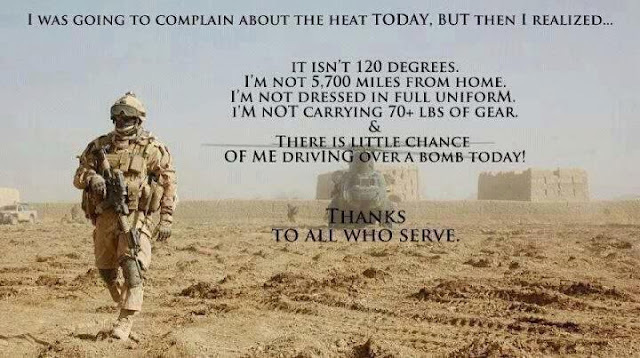 Nothing more needs to be said but....... Thank YOU from the bottom of my heart!!! 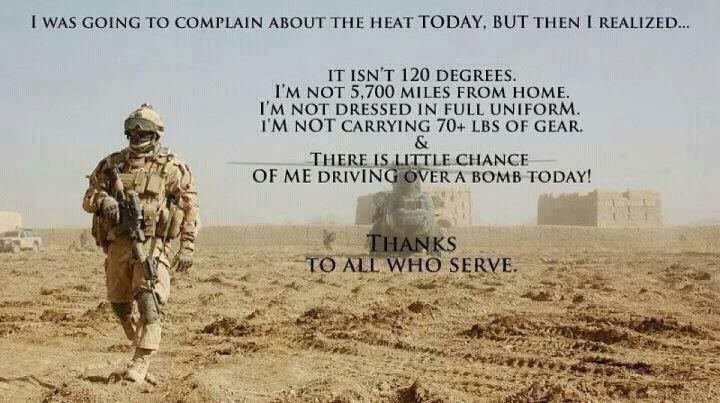 ....and I will NOT complain about the heat!!! I have been sewing up a storm, and made several things... first up this quilted bag. I made it out of Mary Engelbert fabric. I did a simple quilt stitch. ...and I put a magnetic closure on it!! .....inside. This is my take every where bag. When ever I go sewing out of my house..this baby is loaded to the top!! I also put together a quilted cover on one of my art journals. 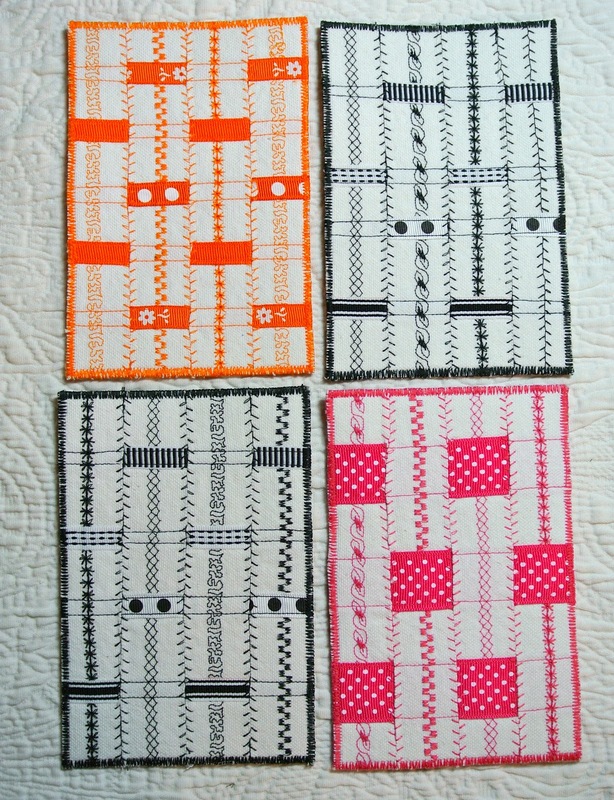 Gotta love Kaffe Fasset fabric!! 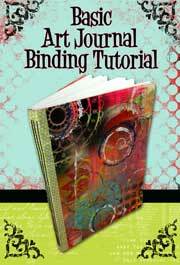 ... and I have been stitching paper.. for making art journal books. With these and many other kinds of papers I will be binding my own journal. Here is a close up!! Well, I am off to keep sewing!! 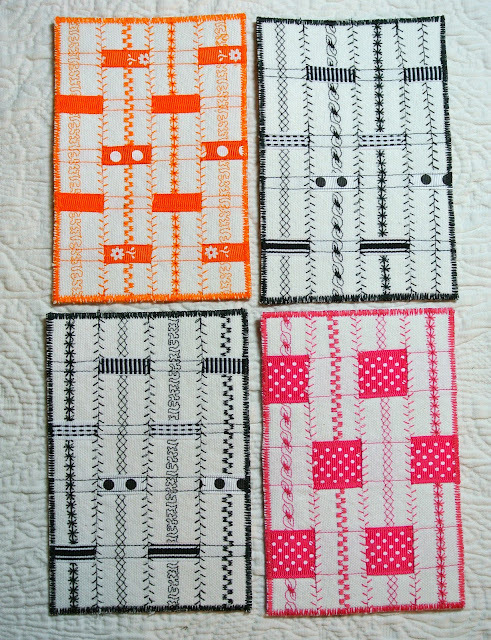 The quilties are ALL here...I will be taking pictures and trading them out this weekend. I will ship on Monday!! Ps. one last photo..... my baby girl is getting very big!! Please have a great weekend! Art Journaling Junkie Part 2 !!! Here is a book that was given to me by a very special new friend!! How did I meet her you ask?? Through instagram!! I am a huge fan of instagram. It is like twitter..but with pictures!! 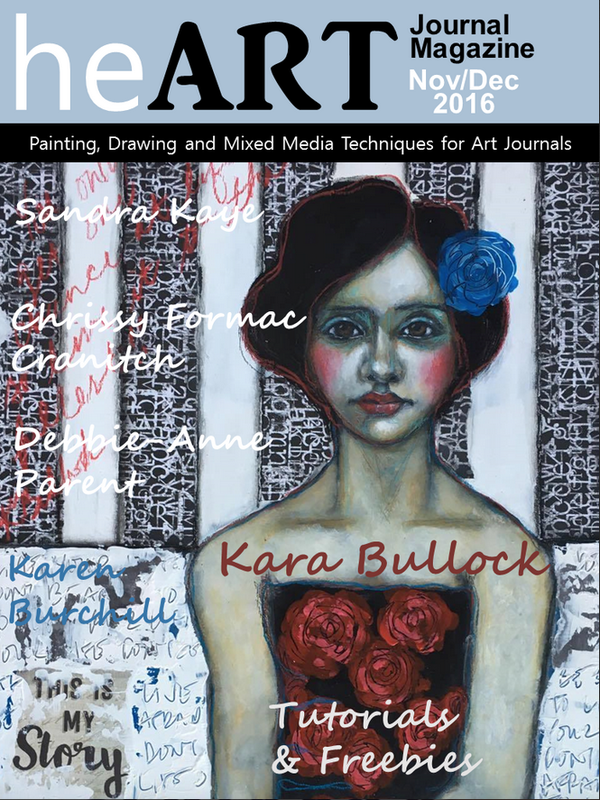 So, I have been following several art journal Ladies. One such lady is Emily..from Canada. She posted on instagram that she was coming to my town...Well, I just had to meet up with her..and she was game. We met at the Frenzy Stamper store, and had an instant connection. 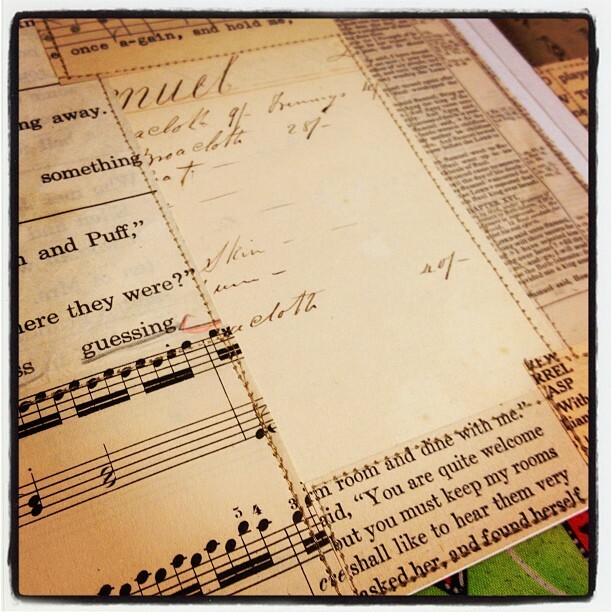 She made an altered book and gave it to me!! I was just tickled pink.!! And I have been using it a lot. Above is the inside cover!! Emily sat and showed me how to do gel transfers and how to draw her wonderful doodles!! The above is a gel transfer of one of her doodles. Emily also has a blog..if you want to see more of her wonderful doodles go HERE!! I find myself wanting to just sit and doodle all the time now. It is very relaxing!! I carry this little book in my purse with pens. Then when I am sitting and waiting on something...out it comes and I doodle!! My little one was jumping with her friends in a trampoline park!! Since I finished a journal..I decided I needed a new one!! (not that I don't have 4 I am working in right now) LOL!!! First page in my new journal!! Been practicing my Emily like doodles!! If you go to the app store and pick up the Instagram app for your phone. 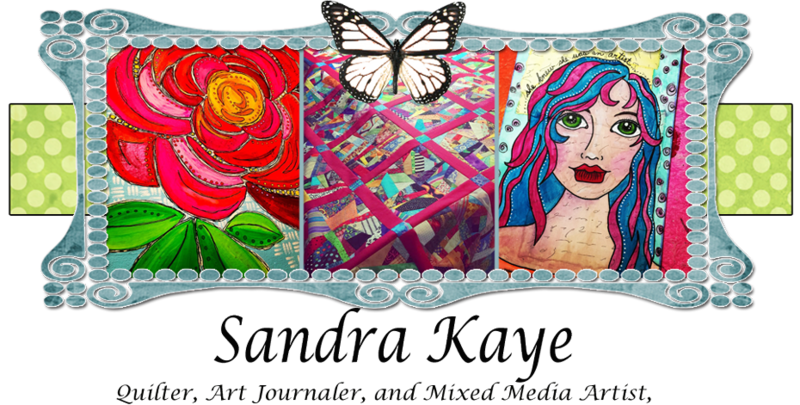 You can follow me by searching.... sandieloves2art. You can find Emily under... emilylagore. Well, that is it for now!! Thanks for stopping in!! Boy, oh boy.... have I been art journaling my brains out!!! And having a BLAST doing it!!! So, sit back and enjoy my different journals!! I am so excited!! I have finished my very first art journal!! I love making the books...but I never seem to fill them up!! I am forever moving from book to book. Well, one day they will fill up!! And that is what this journal did!!! Here is the cover!! ...the very last page in this journal!! I decided to go out with a bang and a lot of texture!! I used dry wall tape from the hardware store. I put it down first, then gesso over it. Then I started adding color. I have about 10 more pages from other journals that I have done recently... but I don't want to bore you..or make this post to long... so part 2 will be posted later this week. Have a wonderful week my friends!! 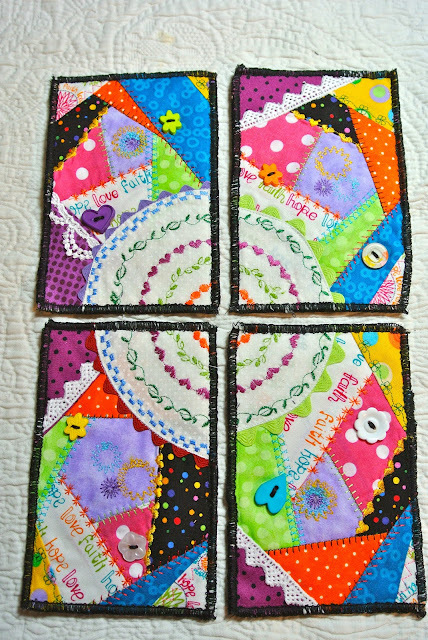 Some Sewing and a Winner!! I would love to start this post off by saying WOW!!!! The Christmas blog hop was so fun and ALL the comments I received were so inspiring and humbling as well!!! It just blows my mind away that so many people had such wonderful things to say about my art and my blog!!!! So BIG THANKS YOUS to each and every person who left a comment and to all my NEW followers as well.!!! WOW!!! The winner will be announced at the end of this post. I wanted to show off my new wallet!! I made it out of my favorite Ricky Timms fabric. ...and before you ask.... There is NO pattern. When I make my bags and such I never use a pattern. I just wing it. Okay, maybe sometimes I use a pattern for purses. But, usually I don't. I just bought these business card holders that you would put in a calendar, and built the wallet around them. You can buy all kinds of pockets to use in your wallet too! I put my coupons, cards, and receipts in these pockets. I even put a zipper pocket in to hold my change. And a pocket in the front to hold my check book and money. Then added a closure with yo-yo's and a snap...and you have a wallet. This little wallet gets a lot of attention when ever I pull it out. Well, on to my give-a-way....again I would like to thank every one for the wonderful nice things you all said to me...It was very sweet and inspiring!! Linda from Little Bits and Pieces!! You need to email me with your address so I can mail this really cool pattern out to you. Congrats!!!! Thanks again for stopping by and following my art journey!